TA was developed by Canadian-born US psychiatrist Eric Berne during the late 1950s. TA is designed to increase the communication effectiveness of individuals: just as we can make a financial transaction, TA examines the social transactions we make with one another on a daily basis.The concepts are a combination of Rogerian and Freudian personality theories. The main goals of Transactional Analysis as a framework are to learn to analyse our relationships with one another in terms of TA and to develop our ability to engage in straight, effective communication with one another on a daily basis. As a theory of personality, TA describes how people are structured psychologically. 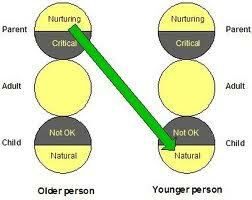 It uses what is perhaps its best known model, the ego-state (Parent-Adult-Child) model to do this. This same model helps explain how people function and express their personality in their behaviour. At any one time we are in one of three possible emotional states: adult, parent or child. If we become aware of our feelings, then we have a choice of which state to be in. Without this awareness, we automatically occupy the state that we have learned from the traditional behaviour patterns in our families. The natural child state contains all the basic, raw emotions that we feel: anger, fear, sadness, fun, affection, love. These in turn produce basic behaviours; eg tantrums, rebellion, tears, hugs, laughter. The adapted child state contains all the behaviours or defence mechanisms we had to learn as children in order to survive, behaviours that resulted from our natural child’s needs not being met. These behaviours include: trying to please, apologising, being dependent, passive anger (sulking, delaying, withdrawing, being bored). The parent state contains all the rules, values and morals we learned from our parents. The critical parent state has all the negative, judgemental, severe behaviours: giving moral lectures, being dominant, telling what to do, not allowing freedom. The supportive parent state has all the positive parental behaviours: comforting, supporting, holding, making supportive suggestions. This is the state that is not ruled by emotion; it is rational and logical, working with the facts. This is the best state in which to plan, consider, decide and act. It is also the only state in which we can learn something new about ourselves. (That is why no-one ever changes their mind during an argument.) We have to be in an adult state to listen effectively to another person’s point of view; to consider new facts; to evaluate our behaviour. We unconsciously choose our feelings: no-one makes us feel anything. Once we consciously consider our feelings, we can make a conscious choice: to act on them or not. To move into adult state from the parent or child position, we have to recognise our emotional state in the first place and then, using rational thought, make a conscious decision to change. 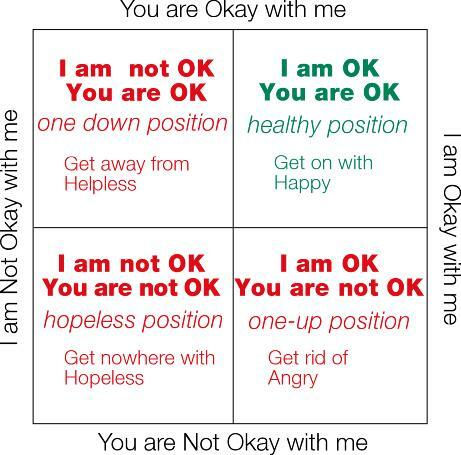 Eric Berne initiated the principle within Transactional Analysis that we are all born ‘OK’ — in other words good and worthy. Frank Ernst developed these into the OK matrix, (also known as the ‘OK Corral’ after the famous 1881 Tombstone shootout between the Earps and the Clantons). These are also known as ‘life positions’. 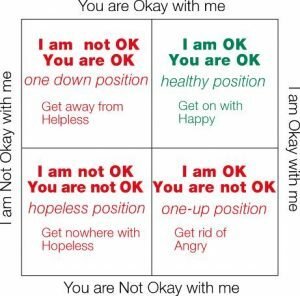 When I think I’m not OK but you are OK, then I am putting myself in an inferior position with respect to you.This position may come from being belittled as a child, perhaps from dominant parents or maybe careless teachers or bullying peers. People in this position have a particularly low self-esteem and will put others before them. They may thus has a strong ‘Please Others’ driver. People in this position feel themselves superior in some way to others, who are seen as inferior and not OK. As a result, they may be contemptuous and quick to anger. Their talk about others will be smug and supercilious, contrasting their own relative perfection with the limitation of others.This position is a trap into which many managers, parents and others in authority fall, assuming that their given position makes them better and, by implication, others are not OK. When I consider myself OK and also frame others as OK, then there is no position for me or you to be inferior or superior.This is, in many ways, the ideal position. Here, the person is comfortable with other people and with themself. They are confident, happy and get on with other people even when there are points of disagreement. This is a relatively rare position, but perhaps occurs where people unsuccessfully try to project their bad objects onto others. As a result, they remain feeling bad whilst also perceive others as bad.This position could also be a result of relationships with dominant others where the other people are viewed with a sense of betrayal and retribution. This may later get generalized from the bullies to all others people.